Japanese beetles were accidentally introduced to New Jersey in 1916. Before this, Japanese beetles were found only in Japan. They were never considered a pest until they came to the United States. During the 1950’s and 1960’s their population grew to concerning numbers in Ohio. 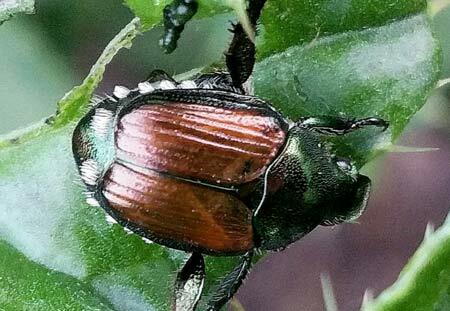 Japanese beetles are now the most devastating pest to the Cleveland, Ohio landscape. Japanese beetles were introduced into an ideal situation. In fact, many Japanese plants and insects do well in our region. Multiflora rose, Kudzu Vine, and the Japanese Maple are good examples. The climate of Japan and United States are very similar to each other. The eastern United States is different to Japan in one major sense. We have covered large sections of our land in turf and pasture grass. These are the areas that have allowed Japanese beetles to proliferate. It is a perfect environment for the larval stages (grubs) to develop into adults. Once developed, Japanese beetle adults feed on over 300 plant species. Japanese beetles have become the perfect dual threat to our landscapes due to their broad diet and our region’s biodiversity. Cleveland Ohio’s climate is perfect for them, and there is plenty of food to feed all life stages. Adult Japanese beetles eat the tissue between veins of leaves. This form of damage is called skeletonizing. Grubs feed on plant roots and organic matter. They are very damaging to turfgrass. When turfgrass pulls off the soil like a loose fitting wig, you probably have grubs. Also, if skunks dig up your lawn at night, you probably have grubs. Japanese beetle control can be complicated since there is such a large infux of them all at once. They seem to fly in from everywhere. Japanese beetle populations can flucuate from yard to yard. The more of the 300 edible plant species that you grow, the more Japanese beetles you will be faced with. Members of the Rose Family, Japanese Maples, and Birch Trees, see the most damage from Japanese beetles in Ohio. Purple Sandcherry and Crabapple Trees, are two examples of plants in the Rosaceae Family. The adults emerge the last week of June through July in Ohio. Once they emerge they seek out a food source. An odor is then released to attract more beetles to the plants. They feed, mate, and lay eggs until mid-August. After the eggs are laid they hatch in a week or two. Then they begin feeding and developing until winter when they burrow deep in the soil. They reemerge in mid-April, continue their development and form a pupa in an earthen cell 1 to 3 inches deep in the soil. Lets face it, Japanese beetles will always be a threat to our landscapes in Cleveland, Ohio. You can apply grub control and adulticides to your heart’s content, but that has very little effect in the grand scheme of things. What I suggest to people seeking to control Japanese beetles, is to replace effected plants with resistant varieties. If your yard is constantly plagued by this devastating pest, then replace the plants that the beetles are eating with plants that they do not eat. It is that simple. This can be far more cost effective and safe, than long term chemical control to protect your plants. The adults do not like to feed on the following resistant plants: ageratum, arborvitae, ash, begonia, bleeding heart, boxwood, cockscomb, columbine, coralbells, coreopsis, daisies, dogwood (flowering), dusty-miller, euonymus, false cypresses, firs, forget-me-not, forsythia, foxglove, hemlock, hollies, hydrangeas, junipers,, lilacs, lilies, magnolias, maple (red or silver only), mulberry, red and white oak, pines, snapdragon, tuliptree, violets and pansy, or yews (taxus). Traps seem to only be effective if the area is isolated from any outside Japanese beetle population. Otherwise, traps tend to attract more adults into the area than would normally be there. The only other way traps are effective are if the whole neighborhood uses them. In order to have successful japanese beetle control, it is important to attack them during the larval and adult stages of their life cycles. Many people in Ohio seek control measures during July and August. This is when the adult Japanese beetles are feeding on their plants. A proactive approach to Japanese bettle control is far more effective than a reactive approach late in the season. Insecticides can be effective at reducing adult beetle populations. For homeowners trying to do their own pest control, I would suggest using a product called Orthene, or Eight, instead of the common Sevin. Sevin controls many insects including the bee population which is becoming a major ecological issue. One of the negative safety factors about treating with adult insecticides, is that they need to be reapplied as frequently as every 5-10 days. Using the same product over and over also leads to pesticide resistance. You may find over time that it becomes increasingly difficult to control them using a once effective product. This is the result of a pest developing pesticide resistance. There are systemic insecticides available for use with an active ingredient imidochloprid. The plant takes this into its system, and kills any insect feeding on it. It works the same way spot-on flea medication works on your pets. This product has to be applied 20 days before any anticipated pest issues arise, but can provide season long control. This product is commonly used on ash trees to defend against the emerald ash borer. We never recommend relying solely on chemical controls to manage a pest population long term. It is best to integrate chemical controls with a combination of cultural and mechanical controls to form a successful long term plan. Due to exposure to the elements, pesticide sprays do not remain effective on plants for long periods of time. Weather dependent, you get about a week’s residual when you spray adulticides on plant material. It is important to note, that most over the counter sprays for adult Japanese beetles are pyrethrins. These provide very little to no residual control. It can be just as effective to pick them off by hand and drop them into soapy water. Pest never gain resistance to mechanical controls! Although this may not appeal to everyone, it can be very effective if you catch them in time. When adults enter an area and find a food source, they excrete an odor that attracts more adults to the area to feed. If you catch these scouts early in the season and keep up on it, you can have very good results. Do this in the morning or early evening, when they are less active and easier to catch. If you combine beetle control with grub control, you can effectively control your Japanese beetle population. Grubs are best treated when they are actively feeding near the soil surface and are small. The best time for grub control is in late July until mid- August. Milky spore disease is not very effective in Northeast Ohio. The spores have to build up in the soil for two to three years to be very effective. During that time insecticides shouldn’t be used. That way the disease can build up in the grub population. Our winters may be too cold for milky spore disease to establish itself. Entomopathogenic Nematodes have recently become commercially available. They seem to provide moderate control of Japanese Beetles. Some product names are Biosafe, Biovector, Exhibit, and Scanmask. Preparations containing Heterorhabditis spp. seem to be more effective than others. Apply the nematodes when the white grubs are small. Irrigate before and after applying the nematodes. Japanese beetles are well established in our area. Populations flucuate greatly from one year to the next, and from one area to another. When dealing with Japanese beetles first attempt to manipulate their environment. Reduce areas of turfgrass. Install resistant varieties or species of plants that Japanese beetles do not feed upon. Be cautious planting any member of the Rose Family. Pollinator warning: Use pesticides sparingly and do not apply pesticides to plants while flowering.